Taking a day trip to a date farm today, and next week I’m spending a couple days at Disneyland, so posting will probably be light. Getting closer to being finished with NOD 8 and Mystery Men! – excited about that. Hopefully some glimpses at the finished pages of Mystery Men! soon. Ox ogres appear as massive crabs with the heads of oxen and the tusks of elephants. They dwell in coastal waters and only emerge to hunt. Kasha are cat demons that prowl the fringes of civilization in search of funeral processions. When they find one, they leap from the underbrush and sieze the corpse, dragging it into the forest to devour it. The ferocity of the attack is such that, provided the kasha achieves surprise, all in attendance must succeed at a saving throw or be stunned and unable to act for 3 rounds. The kasha is exceptionally difficult to track. Kasha make their lairs in burrows beneath dead pine trees. They decorate their lairs with the jewelry and funeral shrouds of their meals. The soul of a devoured corpse cannot enter the afterlife and thus wanders the woods in which the kasha makes its home as a ghost until the kasha is destroyed. Ninjas are humans that have trained themselves in the arts of stealth, assassination and illusion. When encountered on the job they wear black clothing, hoods and masks. Ninjas have all the abilities of assassins, including the assassins’ death attack, the ability to make a stunning attack as a monk and the ability to cast phantasmal force and ventriloquism. Ninjas are armed with shuriken and wakizashi. They might also carry hankyu. Ninjas also carry a collection of powders that they can blow into their enemy’s faces. These powders can be used to blind an opponent, cause itching and sneezing (-2 to AC and to hit) or sleep (as the spell) unless a saving throw is made. Groups of four or more ninjas are led by a 3 HD genin. If a clan is encountered, there is one genin per 10 ninjas. The clan is led by an 5 HD jonin with the ability to cast invisibility and obscuring mist. He is assisted by a 4 HD chunin with the ability to cast obscuring mist. Both jonin and chunin are capable of flipping out once per day, gaining a +2 bonus to hit and damage. 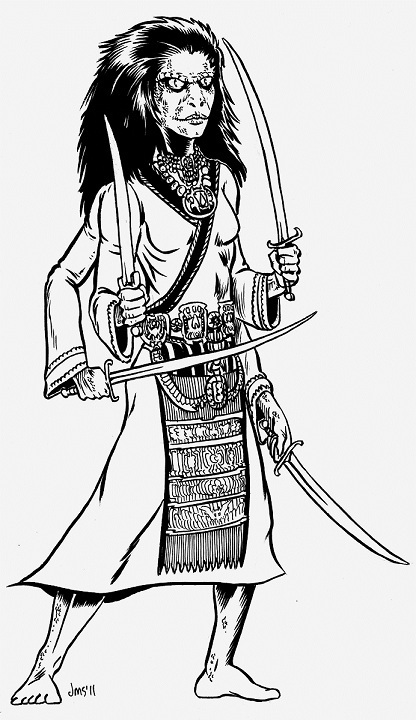 The shamshir are a strange humanoid people who combine mammalian and reptilian characteristics. They have four arms and pale scales speckled with electric blue and long hair that ranges from white to gray to aquamarine. Shamshir have humanoid faces with poison sacs in their checks. Shamshir can replace one weapon attack with a poisonous bite that deals 1d3 damage plus an additional 1d6 damage if the victim fails a saving throw. Because they are so quick, they rarely wear armor. They arm themselves with longbows and katana. Shamshir tribes are ruled by princes called shatyas. Shatyas usually have 4 to 8 levels in bujin. Shatyas are guarded by level 2 to 4 bodyguards. Image of shamshir by Jason Sholtis of Underworld Ink. I cannot recommend him highly enough! Have you statted non-Japanese ninja at some point that I might have forgotten? I just wondered at the qualifier. Cool monsters! Enjoy Disneyland … i've never been, so I must get there while my kids are still young enough to enjoy it. Trey – no, I was just putting in a note on the monsters of where they came from. Paladin – It's tiring and expensive, but fun.